By now everyone knows that the historic Notre Dame Cathedral in Paris has burned. This building was beloved by the world, and it appears to have been a favorite landmark of Houdini's as well. He used the Cathedral as a backdrop in his 1909 The Marvelous Exploits of Houdini in Paris, and also took photos in front of the famous doors. Below is a well-known photo. 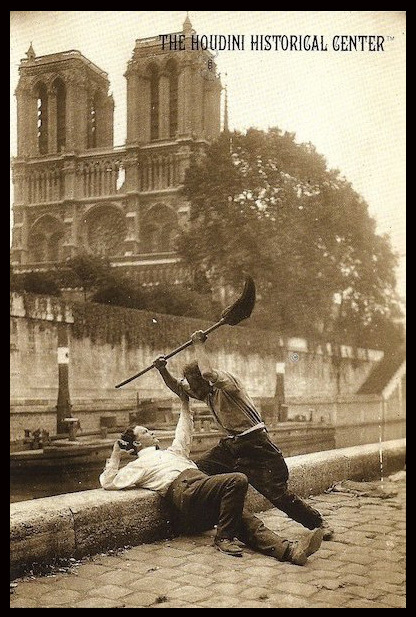 Here he again used Notre Dame as a backdrop while filming random action scenes in the streets of Paris in 1920 (later to be worked into Haldane of the Secret Service). A terrible tragedy and a horrible day. The wire news reports say the roof took most of the hit. The artworks were saved. This building has had a long history of interior remodeling. In 1844 it was completely restored by architect Eugene Violett-le-Duc. Paging John Gaughan for the restoration. Thank goodness it's not as catastrophic as it first seemed, but still a terrible tragedy. Yes, thank goodness they saved so much.